After battling it out with Iggy Azalea last year on Twitter, Azealia Banks is now aiming her vitriol at Erykah Badu. It all started when the veteran R&B singer shared her unfavorable opinion about the Harlem rapper’s music with a fan. From there, a Twitter war erupted between the two artists. Upon reading Badu’s tweet, Banks responded with a couple of rude remarks to the veteran singer calling her “old” and suggesting that she was jealous of her. The ‘212’ rapper also told Badu to keep rocking her headwraps and to shave her armpits. “Lol I think it was very childish of her to try and insinuate that I should show up and fight her… Like.. How old are you?” she added. Honestly, we don’t think Badu was “throwing shade” at Banks. The singer was only expressing her thoughts about Banks’ music. Hopefully, their feud doesn’t go beyond social media. 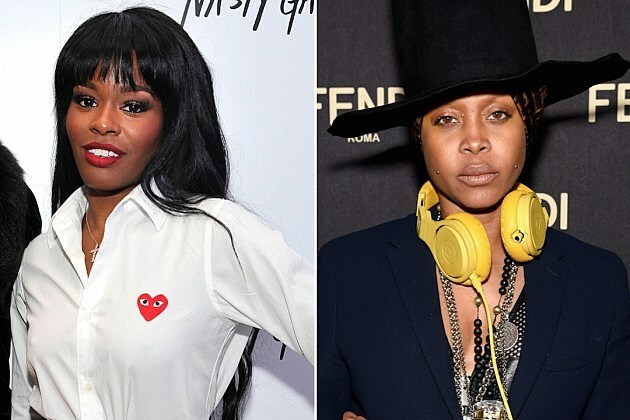 What do you think of Azealia Banks going after Erykah Badu on Twitter? Tell us in the comments below. @fatbellybella @pradahungry lol, what's the shade? Whether or not you like me… You are WATCHING, and that's what's most important. All you folks on black Twitter can go downstairs and get yourselves a cold pop now! @fatbellybella I'm cool, I was just trying to make sure you were cool…. @fatbellybella @bhrisbrown lol you just keep rocking ur head wraps and buying ur musky oils off the table on 125th. @fatbellybella you have to shave your underarms before you try and come for me. Lol I think it was very childish of her to try and insinuate that I should show up and fight her… Like.. How old are you?